From 65 to 130 € the night I book ! 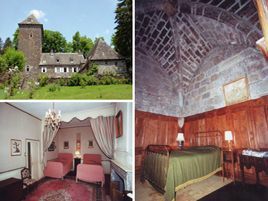 Total relaxation offered in this chateau situated near the largest extinct volcano in Europe and one of the most beautiful glacial valleys. Dating from both the 11th and 18th centuries, this residence has kept all its charm of yesteryear. Spacious rooms decorated with antique furniture. Regional cuisine using organic produce cooked on a wood stove. Kindly welcome and friendly atmosphere..
Specialties : côte de bœuf à la ficelle, pot au feu au cantou, pounti, gâteau de courgette, soupe du jardin, pains et confitures maison. 2 suites and 1 room with bath or shower and WC. 65 euros (1 pers. ), 90 euros (2 pers. ), 110 euros (3 pers. ), 130 euros (4 pers.). Extra bed 20 euros. The closest station is Saint-Flour, located at 35 km.